Can I simply drag and drop images into the chat box of the operator panel? 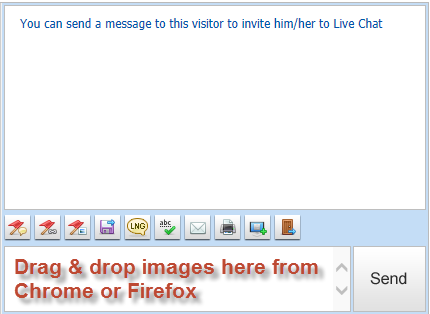 It's possible to drag & drop images from Google Chrome or Mozilla Firefox browsers directly into the chat box and send them to chatting visitors. Simply open either Chrome or Firefox in a separate window then click, hold and drag in image into the live chat software text area under the chat box of the operator panel. The source URL of the image will appear to you & sending it over will show the image in the chat conversation.